Located some 60 million light-years away, NGC 4388 is experiencing some of the less desirable effects that come with belonging to such a massive galaxy cluster. It is undergoing a transformation, and has taken on a somewhat confused identity, but has such beauty that it spurs one to imagine what life forms might reside there. 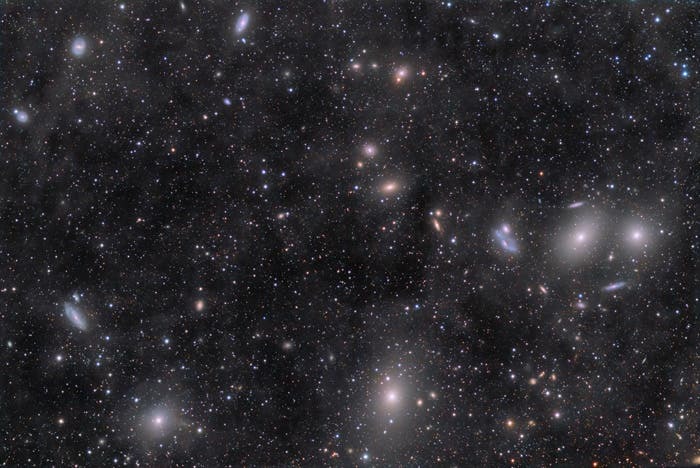 The constellation of Virgo (The Virgin) is especially rich in galaxies, due in part to the presence of a massive and gravitationally-bound collection of over 1300 galaxies called the Virgo Cluster shown below. 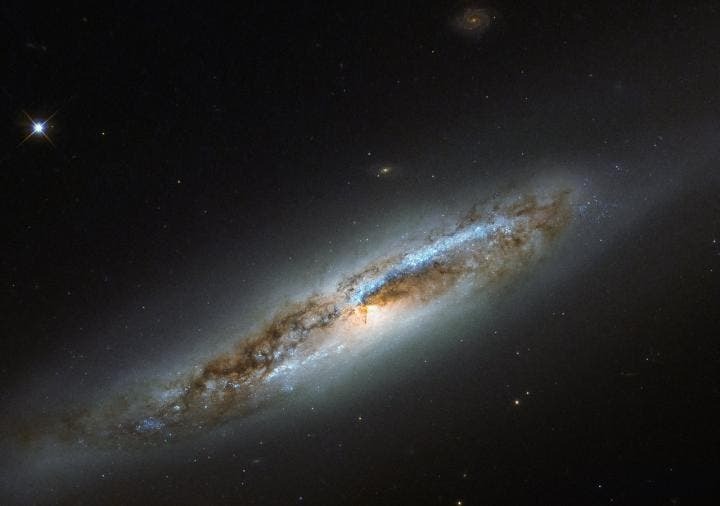 This particular member of this cosmic community, NGC 4388, is captured in the image above, as seen by the NASA/ESA Hubble Space Telescope's Wide Field Camera 3 (WFC3). While the galaxy's outskirts appear smooth and featureless, a classic feature of an elliptical galaxy, its center displays remarkable dust lanes constrained within two symmetric spiral arms, which emerge from the galaxy's glowing core — one of the obvious features of a spiral galaxy. Within the arms, speckles of bright blue mark the locations of young stars, indicating that NGC 4388 has hosted recent bursts of star formation. Despite the mixed messages, NGC 4388 is classified as a spiral galaxy. Its unusual combination of features are thought to have been caused by interactions between NGC 4388 and other galaxies in the Virgo Cluster. Gravitational interactions — from glancing blows to head-on collisions, tidal influencing, mergers, and galactic cannibalism — can be devastating to galaxies. While some may be lucky enough to simply suffer a distorted spiral arm or newly-triggered wave of star formation, others see their structure and contents completely and irrevocably altered. Spiral Galaxy Arms –"Incubate Rocky Terrestrial Planets"
Today's 'Galaxy' Insight –"The Universe is a Green Dragon"